Inadequate amounts of water can stress plants and cause a multitude of problems. Usually, the oldest leaves are the first to show symptoms, yellowing, drying and falling off the plant. During prolonged periods of drought, twigs and branches of trees and shrubs can suffer dieback. There can even be root damage from drought, which generally leads to the eventual death of the plant. Of course the longer the drought lasts, the more damage is done to the plants. Drought during the start of the growing season can cause the most damage of all because the plants are actively growing and preparing themselves for the summer. Certainly, we want to resume regular watering of our plants. It's tempting to want to give drought-stressed plants as much water as they can handle, but it is possible to overdo it. You want to ease your plants back into health. Keep the soil moist, but not wet. Roots need oxygen as much as they need water and keeping the soil saturated will suffocate the roots and lead to more stress. There's not much we can do about too much rain, but we can control the hose and sprinkler. Most plants need 1 inch of water per week or about 1 gallon per square foot. If the plants are growing in sandy, quick-draining soil, were recently planted and have unestablished root systems or have damaged roots, they will need to be watered a couple of times a week, to make sure they are taking up sufficient water. 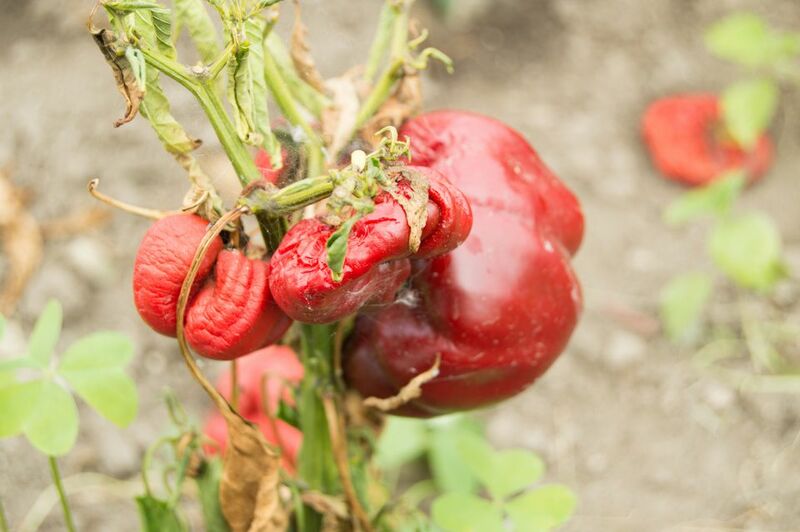 Note to tomato growers: Two common disorders of tomatoes are caused by them receiving irregular amounts of water. Both cracking and blossom end rot are caused by the plants being left dry for a week or two, followed by excess watering. During a long drought, it can sometimes help to prune otherwise healthy plants back by about 1/3, to lessen the plant's need for water. Use your judgment as to which plants need this extra help and avoid cutting back trees and shrubs. They need their canopies to prevent scorching and burning and pruning them back would just cause more stress. After the drought, if the tops of your plants have suffered severe browning and dieback, go ahead and prune them back to about 6 inches from the ground. In many cases, you will see new growth starting at the base of the plant already. Plants seem to know when they are threatened and need to reinvigorate. Remove any dead or dying branches. They won't recover and they make good hiding places for pests and entry points for disease. Synthetic fertilizers that contain salt are the worst option after drought and should be avoided entirely during drought. The salt in the soil can damage the plant's roots and intensify drought damage. Drought-stressed plants are targets for pests and diseases, which will further weaken your plants. While we should be on the lookout for problems throughout the season, keep an especially keen eye during drought. Catch problems early. In some cases, you may need to do some pruning out and maybe even remove the plant entirely. Once your plants have been well watered and possibly fed, make sure they have a 3 to 4-inch layer of mulch around the drip line. Organic mulches decompose during the growing season and by mid-summer, they may have almost disappeared. Keep those stressed roots cool and moist by replacing the mulch as soon as you can. Drought tolerant plants: Some plants handle drought better than others. Choose drought-tolerant plants and create a xeric garden with lower water needs. If you must have plants with high water needs, group them together, so you can water just that small area. Organic matter: Continually add compost and other organic matter to your soil, to improve its ability to retain moisture. Weed: Weeds competed with garden plants for water and nutrients and weeds usually win that battle. Take steps to prevent weeds from taking hold. Rain barrels: Now is the time to attach a rain barrel—or two—to your downspout. It's amazing how much water can be collected after just one rain and how glad you'll be to have it during the next dry spell.